In a bowl, mix the shrimp, tomato, scallions, garlic powder, ground mustard, avocado oil and taste for salt and pepper. Slice your avocado in half, Chop and add into the bowl. 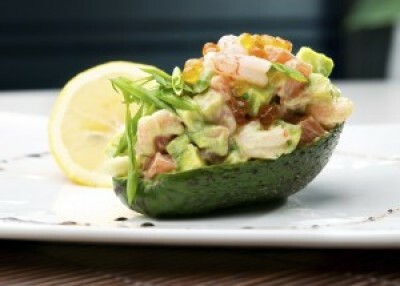 Add the lemon juice on top of the avocado then carefully combine the mixture. Take the hollow avocados and mound the shrimp mixture. Add a little caviar and garnish with additional scallions.